Since it is Sunday, I figured you all deserved a break from the blinding holos! Today I have a Hello Kitty polish from H&M called Cool Summer. Rozie sent it to me as a surprise, I had no idea it was even coming! I LOVE IT. I never eva eva (give your self a point if you get the Outkast reference) would have picked a color like this out for my self. The day after I applied it was my designated swatching day and I had too take it off! And I regretted every second of it! This is 3 coats, the polish was rather gritty and dried matte. 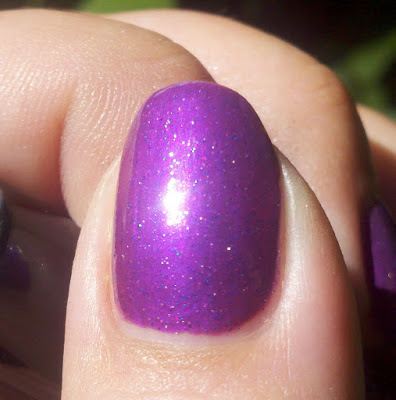 I was afraid it would turn lumpy from all the glitter, but a thin coat (and I mean thin!) of Color Club Vivid topcoat smoothed it out beautifully! My favorite thing about this polish? You guessed it - NO CLEAN UP! I loved the formula, application wise! And although I took it off rather quickly (as usual) I have a feeling this formula won't chip easily. These last two pictures were taken in the shade, and they are not true to color, but they do allow you to see the glitt-eh! The polish is filled with wonderful blue, silver, and pink glitter. Thanks again Rozie! You are a great at picking polish for me!